U.S. Federal Communications Commission Chairman Tom Wheeler speaks about the benefits of broadband at the Brookings Institute on June 26, 2015. Predictions from net neutrality opponents that regulations would choke off broadband investment haven't come true, with several service providers announcing expansions in the four months since the U.S. Federal Communications Commission passed new rules, the agency's chairman says. 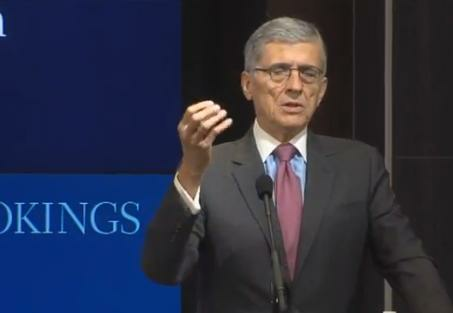 FCC Chairman Tom Wheeler defended the commission's net neutrality rules Friday, saying that it would be "unthinkable" for the FCC to allow broadband providers to operate without consumer protection, interconnection and other basic rules. The FCC is focused on expanding broadband coverage and competition and increasing speeds across the U.S., he said, but the commission's net neutrality rules won't get in the way. "We're not going to let imaginary concerns about investment incentives and the omnipresent boogieman of so-called utility regulation cause us to let up on polices to encourage fast, fair and open broadband," Wheeler said in a speech at the Brookings Institute in Washington, D.C.
CEOs of five broadband providers, including Sprint, Cablevision and T-Mobile USA, have discounted concerns from other providers and free-market advocates that the FCC's net neutrality rules, which reclassify broadband as a regulated, common-carrier service, would discourage investment, Wheeler said. Wheeler also named eight broadband providers that have announced plans to expand their broadband services since the FCC voted in late February to approve the new regulations. AT&T and Comcast, two of the most vocal critics of the FCC's vote to reclassify broadband, are among the eight providers announcing expansions since then, he said. Comcast declined to comment on Wheeler's speech. AT&T didn't immediately respond to a request for comments. Some broadband providers have tried to use a move from copper to digital transmission as "their ticket to escape" responsibilities such as widespread access, interconnection and consumer protection, Wheeler said. Still, the FCC will not engage in "utility-style regulation" that net neutrality critics fear, Wheeler said. The FCC will be a "referee" on the field, he said. "I plan to adhere to the wisdom that the best referees do not make themselves part of the game unnecessarily," he added. "Referees make sure the game is played fairly, they don't call the plays." The FCC will not "micromanage" networks like the agency did in pre-broadband days, Wheeler added. "In that environment, at a time when consumers are demanding better broadband, why would a rational broadband provider not make the investment to give it to them?" he said. "Only if competition is lacking, only if consumer demand is artificially limited."